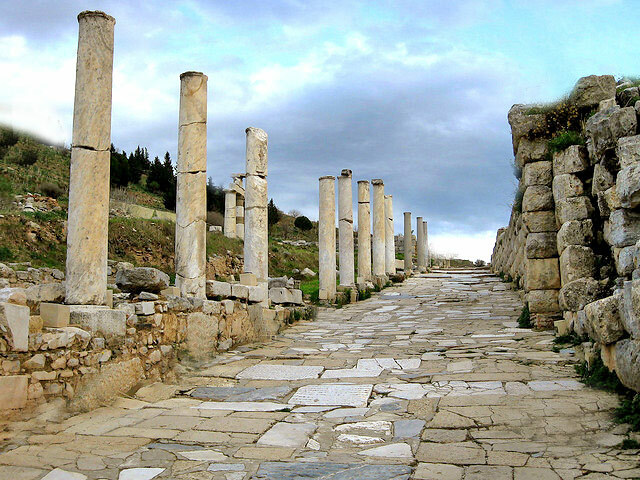 Named after the Curetes (the priests who took care of the flame of the Prytaneion of Ephesus), also known as Embolos, it was one of the three main streets of Ephesus. Curetes street connected Gate of Hercules with the Library of Celsus. It was made of marble and it had been decorated with column on both sides as well as several sculptures including reliefs of the messenger of the gods Hermes, the hero Heracles and the goddess of the Victory, Nike. There is also a headless statue, dating back to the Byzantine era, dedicated to a woman doctor who had offered great services to Ephesus. A statue depicting Sulla's grandson, Memmius, had been placed along Curetes street two and a water spring known as Hydreion had been constructed in front of the statue. A round monument had been erected on the left of the slope towards Celsus Library. It was decorated with flowers and bull-heads and it dates back to the 4th century AD.